Here are two things you do often see on the Norfork River. 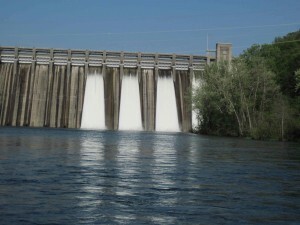 Floodgates open on the dam and a Massachusetts Lobster Fisherman with a fly rod catching Arkansas trout! Ryan, who now lives and works in Arkansas, brought his father, Bill, down for a fly fishing trip. They certainly did not count on the flood gates being open on the Norfork River. Regardless, it was not a big deal for a genuine lobster fisherman like Bill who runs eight hundred lobster traps in the Atlantic Ocean off the coast of Massachusetts. 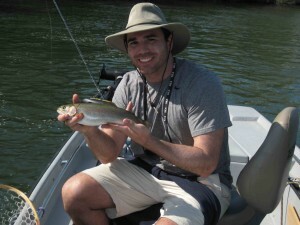 As you can see Ryan and his father released some nice fat Rainbows. Maybe Bo will take me to Massachusetts and do some lobster fishing.